Mr Sim says it is now more convenient for him to go to the toilet, with the addition of features such as grab bars and a ramp under the Enhancement for Active Seniors scheme. What began as an ordinary trip to the bathroom at home in November last year ended in agony for Mr Sim Kok Keng, 72. The Woodlands resident heard a "crack" and felt a sharp pain when he stood up after using the toilet in his Housing Board flat. Doctors later said that his left heel bone had split open. While the retired vegetable seller had always found it difficult to walk after contracting polio as a child, the injury made it tougher for him. But flat upgrading last month provided timely assistance. Mr Sim and his wife Jenny Koh, 64, were one of 105,500 households that had applied for the Enhancement for Active Seniors (Ease) programme as of last month. The scheme, launched in July 2012, allows HDB home owners to equip their flats with elder-friendly fittings such as grab bars, slip-resistant tiles and ramps. The HDB saidsome 42,200 households have applied for Ease directly, while another 63,300, including the Sims, opted for it through the Home Improvement Programme (HIP). Citizen households with a family member aged 65 and above qualify for Ease. They also qualify if a member is aged between 60 and 64 but needs help with at least one of six activities of daily living, such as bathing, dressing or feeding. "It's much more convenient to go to the toilet now," said Mr Sim, who now uses a walking stick. Madam Koh agreed: "We used to put three plastic stools in the rest- room so he could hold on to them. But the grab bars are much safer." 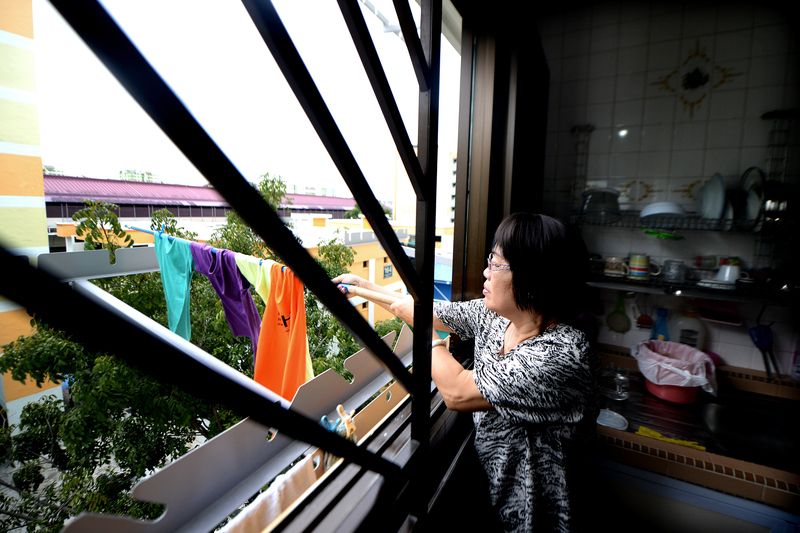 His wife, Madam Koh, is using new laundry drying racks installed under the Home Improvement Programme. Introduced in 2007, HIP helps address common maintenance problems related to ageing flats, such as spalling concrete and the replacement of pipe sockets with new laundry drying racks. These "essentials" are paid for by the Government. Optional HIP components include those under Ease, and improvements such as toilet upgrades and a new front entrance gate. The Government subsidises up to 95 per cent of the cost of these for Singaporean households. Only flats built up to 1986 that have not undergone the Main Upgrading Programme are eligible for HIP. Works proceed when at least 75 per cent of a block's eligible households have voted in favour of it. The scheme is popular, with an average support level of 90.1 per cent based on a poll, the HDB said. This had MPs such as Ms Lee Bee Wah asking in Parliament last month if it could be extended to units built after 1986 when they become 30 years old. National Development Minister Lawrence Wong replied that the HIP is not a one-time expenditure, but a multi-year expense that has cost "billions of dollars". So the Government has to "consider whether or not we are able to afford such a major programme that will run through many years, potentially even past this term and future terms of government". About 220,000 flats have been announced for HIP so far. Works have been completed for about 74,000 flats and are in progress for another 93,000 homes. As of March, the Government has spent about $1.47 billion on HIP and $30 million on Ease. It is expected to spend another $464 million on HIP and $19 million on Ease by March next year.